With over 40 years experience in renting and manufacturing motorhomes, Cruise America know exactly how to make motorhome holidays as easy as possible. Cruise America, the sister company of Cruise Canada, custom build three motorhome types so its easy for you to choose the right motorhome depending on the number of people travelling, your preferred duration and individual requirements. 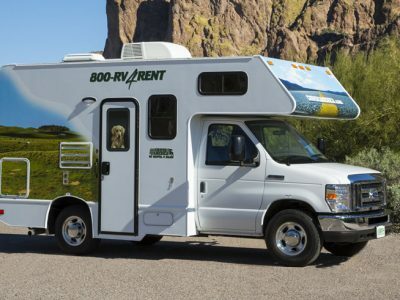 The RVs (recreational vehicles, also known as motorhomes) are almost always under 3 years old with the fleet regularly updated. 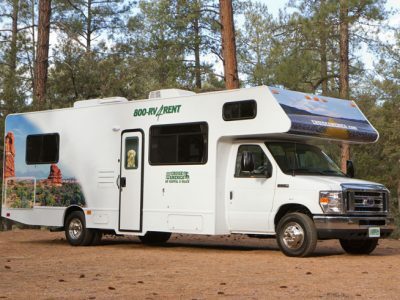 Vehicles range from a compact RV sleeping up to 3 people, to a large 30′ motorhome sleeping up to 7 people. Cruise America have one depot in Alaska which is located in Anchorage. A minimum of 7-days rental applies. All vehicles come with a refridgerator, freezer, hob, microwave and cupboards for food storage. All have a shower, basin and flush toilet and all vehicles come with power steering, power brakes and automatic transmission. Insurance is included in your rental price. You are automatically covered for one million dollars liability, plus accidental damage (subject to a deductible excess, up to $1,000). Mileage must be pre-paid in advance, in blocks of 100 miles, 500 miles or unlimited mileage. Personal kits (bedding, towels etc) and vehicle provision kits (pots, pans and crockery) can also be booked and paid for in advance (highly recommended). 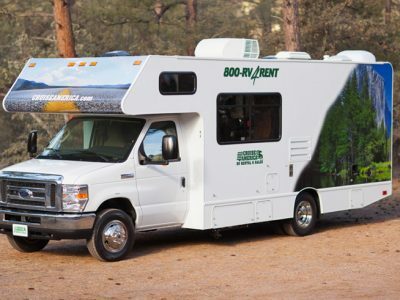 Please view our vehicle rental factsheet for full details of motorhome hire conditions in Alaska, including minimum hire periods, one-way rental fees and other local payments. These may vary depending on the location and category of vehicle hire. The factsheet also contains more detailed vehicle specifications. Our motorhome rental is quoted on an on request basis as prices can vary considerably depending on size of vehicle, dates of hire, duration and pick-up and drop-off locations. Cruise America operates a dynamic pricing policy which means that prices change according to the time of booking and popularity of the vehicle type – early booking is therefore recommended to secure the best possible price. As a very rough indication, a compact RV can start from as little as £53 per day (minimum 7-day rental) in low season (April, May / Sep, Oct) based on a Anchorage pick-up and drop-off. Prices can increase to as much as around £213 per day based on a Large RV in peak season (Jul-Aug), also pick-up and drop-off in Anchorage. Please contact our team for current prices. A valid driver’s license from the country of residence is mandatory. All drivers must be 21 years or older, no maximum age limit. An international driver’s license is recommended but is only valid in combination with the national driver’s license. Please that note an overnight stay on arrival is obligatory for international travellers, prior to collecting your vehicle the following day, as it is not considered safe to drive an unfamiliar motorhome directly from a long-haul flight. A major credit card is required upon collection of the vehicle to provide a security guarantee for the duration of the rental. You will receive a full orientation of your rental vehicle before you leave the depot.